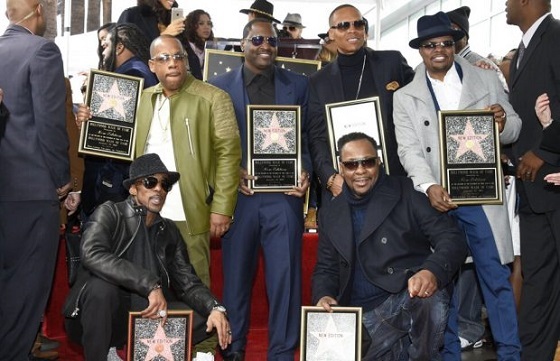 New Edition now has their own star on the Hollywood Walk of Fame! The R&B supergroup that ruled the charts back in the 80s received the honor on January 23. Ronnie DeVoe, Ricky Bell, Michael Bivins, Bobby Brown, Ralph Tresvant and Johnny Gill were all present for the ceremony. About 1,500 people showed up to celebrate with the group as they received the plaques and spoke about their work in the industry. NE is definitely deserving of this! With megahits like “Candy Girl,” “Cool It Now” and “Mr. Telephone Man,” as well as many No. 1 records and awards, the group has had amazing impact on music. Bobby, Ralph and Johnny also had successful solo careers, and Ricky, Mike and Ronnie did well Bell Biv DeVoe (and are back with a new track!). The ceremony came just one day before the group's highly anticipated three-part miniseries, The New Edition Story, airing on BET over the next few days, starting tonight! Congrats to New Edition on this honor!